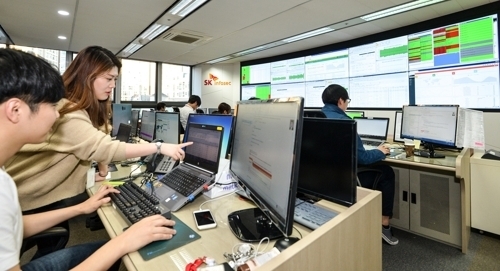 SK Telecom said Friday the mobile carrier will acquire SK infosec, an information security subsidiary of SK Group, through a comprehensive stock exchange. SK infosec is the country’s biggest data security solution provider with around 200 billion won ($175 million) in annual sales. The company is the first Asian business to join the Cyber Threat Alliance of global security firms. SK Telecom will exchange some 1.6 percent treasury stocks with a 100 percent stake in SK infosec, and will include the company as the mobile carrier’s subsidiary. By putting the digital security unit under its ownership, SKT plans to utilize the firm’s solutions to enhance data security of the mobile carrier’s autonomous driving, smart home and smart factory services when the fifth-generation network is commercialized. SKT also owns ADT Caps, a security system company, after acquiring the company for $1.2 billion from Carlyle Group in May.